Kevin O’Leary, founder of O’Leary Funds, serial entrepreneur and Shark Tank Host Investor, spoke to the New York Stock Exchange about his entry into the US financial marketplace with O’Shares Investments and its series of Exchange Traded Funds. 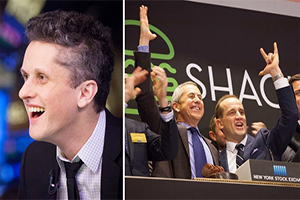 The first O’Shares ETF, OUSA, recently listed on the NYSE and Mr. O'Leary shared his thoughts about the launch of the fund, his investment philosophy and the important lessons he has learned over the years as a financial professional. Can you talk a little bit about OUSA and what differentiates it from other ETFs? Kevin O'Leary: First, let me say a quick word about what an ETF is for those who are unfamiliar. Exchange Traded Funds or "ETFs" are best described as portfolios or baskets of assets, similar to mutual funds, into which investors can buy. But they differ from mutual funds in that they are traded on an exchange in the same way as regular stocks, so investors have much quicker and easier access to them. Stepping back, years ago my mother taught me something really important. She said to me, "never spend the principle, just the dividends," so I only own dividend-paying stocks and, frankly, the wisdom of that rule is supported by the numbers. Over the last 40 years, 70% of market returns have come from dividends, not capital appreciation. I applied those same principles to create my first ETF, the O'Shares FTSE U.S. Quality Dividend ETF (NYSE Arca: OUSA). What makes my ETF different is that it is a smart beta ETF that mines for companies that are growing dividends, are less volatile historically than the market and have a very high-quality balance sheet, versus being tied to market capitalization like the traditional ETF. I would also add - and this is a very important point – that this fund has complete sectoral diversification. Why was now the right time to launch in the U.S.? KOL: The answer is a simple one - because I couldn’t find a product that met my investment criteria. As an active investor, I’m eager to put more money into the U.S. economy, firstly because it’s growing, and secondly it’s very stable compared to other regions across the world. That being said, I also want to own stocks according to my own priorities. I couldn’t find another ETF that really met my metrics so I had my team build me one, and we created O’Shares Investments. OUSA is our first product. It is listed here on the New York Stock Exchange, and I’m going to put it in my family trust - that’s how much I believe in it. You have spoken frequently in the past about being a “disciplined investor,” how does a disciplined investor behave? KOL: If you’re a disciplined investor you don’t get distracted by hype. I’m not saying it’s not fun to buy trendy stocks or that it’s not exciting to take a risk on an investment; I just don’t do it myself. The other hallmark of a disciplined investor is patience. I am happy to wait until a company matures before putting my money into it. I’ve learned over decades that the only thing that’s the truth in investing is cash flow, that’s what matters. One of the first things I look for in the companies in which I am considering investing is whether they are growing cash dividends. A company that does not pay a dividend is a speculation, not an investment. Only companies that pay dividends are investable to me. For new investors just starting to build their portfolios, what are the factors they should consider when looking for products to include? KOL: To come back to a point I made earlier, the key is to look at sectoral diversification. At any given moment, it’s hard to know which industry or vertical is going to be the one that provides all the performance in the market, so over the long run a wise investor will look to diversify wherever they can. Lately healthcare has been terrific, as have utilities, telecommunications, and medical supply companies. But again, I’m looking for sectors that pay dividends. Companies in the pharmaceutical space have been fantastic in that regard, and many high-profile technology companies are now paying dividends because investors like me have spoken and said it’s time to do so. These are the principles that guided my team and I as we built O’Shares. We identified the companies in each sector that are the best in class – the ones that are growing dividends, have less debt, and are less volatile – those are the names you’ll find in O’Shares. What were some of your criteria for choosing a listing venue? KOL: There’s no argument that if you’re an investor like I am - and I invest in all continents - you go to the place that’s the leading expert. That’s why I listed on the New York Stock Exchange—they are the leader in ETFs and as an investor, their transparency and stability are very important to me. NYSE Arca is where I buy ETFs and it’s where I want mine listed, there really was no other venue in the conversation. Note: The opinions expressed herein are those of the interviewee, and do not constitute investment advice or the endorsement of any company, product, service, publicly-traded stock or investment vehicle.